It’s a Beautiful Signature Day! It’s hottttttt outside… like, 33 degrees Celcius and humid sort of hot! 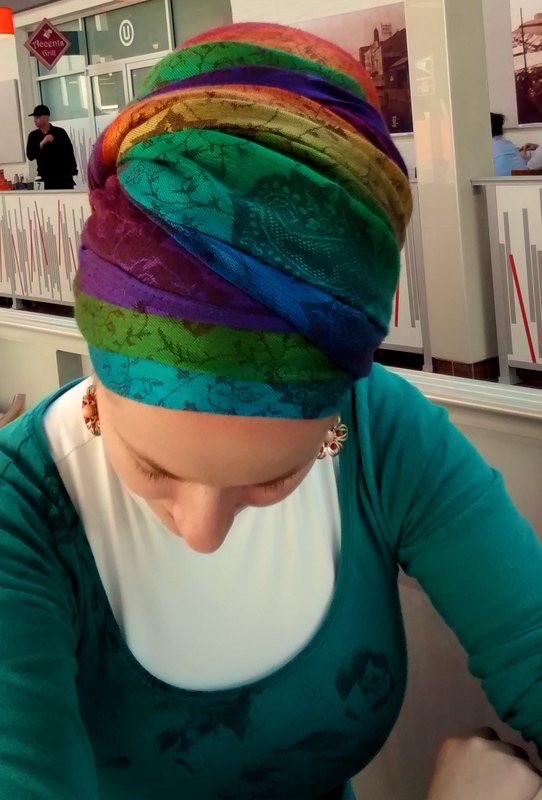 This morning I took one look at my tichel collection and felt an intense calling coming from my signature scarf – I haven’t worn it in over a month! How did that happen? I did a Yael wrap and WOWZA!! I just fell in love with this tichel allll over again! Can you see the intense burn on my upper forehead? That’s from Sunday when I was silly and stayed out in the sun during our community kid’s orchestra concert. Learn from my mistakes y’all… tichel sunburns are NOT attractive! You look great. I got a tichel sunburn last weekend so I feel your pain. SUNSCREEN. It is so pretty. I need to order one. Just thought I’d share…I walked into work today wearing my beautiful green sari sash with a lilac 2 in 1 and a Co worker said looking at you will make me happy all day I love purple and green. Our tickets help make others days brighter :). That is supposed to be tichels not tickets. Darn auto correct! So, any suggestions for me to shop would be appreciated. Wowww I wish I could help you but I am totally not familiar with tel aviv! If you’re looking for places to shop near Tel Aviv, I would try Bnei Brak. Or you could just wander around the market and hope to find some good buys. Good idea! Thank you. I had forgotten that Bnei Brak will be close enough since I will be near Tel Aviv University. I also found a Chabad House at the University so I am sure some of the women or the rabbi’s wife could direct me. And, Andrea, where would you suggest in Jerusalem for shopping for modest clothing, ie. skirts, tops? I plan on visiting Jerusalem several times while I am there. Since my son and dil work, I most likely will be seeing them on Shabbat, so during the week, I will be free to travel and shop. My best friend Gila who used to live in Jerusalem and visits there about twice a month would know any street names that you can give me for shopping. Besides, Gila probably would be interested in shopping, too:) I need outfits to match my Wrapunzel tichels! Walk up and down Yafo street, around King George – there are TONS of shops around there! I’m not Andrea, but you can try walking around Ben Yehuda/King George – there are a lot of stores in that area. And about ten minutes away from the big kikar with Maafe Neeman – there’s a light rail stop right beside it – is Meah Shearim and Geula. Instead of following the train tracks, you turn onto the other street. One side is called King George and the other is called Natan Strauss. Go up Strauss and you’ll find Geula. If you are looking for tichels, though, my first stop would be the shuk (though maybe I’m wrong), and my second King George. Although, most of mine were bought outside the tachana merkazit. It used to be cheap, and probabaly still is, relative to the inflation. Thank you, you have been helpful. My friend Gila had friends in Geula so will know exactly what area you are referring to. She also is in Jerusalem a couple times a month. I haven’t been in 10 years, before the light rail. But, I vaguely remember at least the street names. If you were there ten years ago, you’ll remember that there were two kikarim where you could cross on a diagonal – with X crosswalks in the middle. One is no longer an X because of the light rail (the one by Maafe Neeman) and the other is where it was – in the middle of Meah Shearim-Geula. Was going to mention it but realized that one X isn’t there and didn’t want to confuse you. I live in Israel, so if you need any help while you’re here, feel free to contact me (go to my blog and click “contact me” in the bar just under the header). Yes, definitely order one of the signature pashminas. Note, that Andrea is wearing the darker colored one. I have both the darker one and the lighter colored one. I, like Andrea, prefer the darker colored one. The light color one would be great if you wear lots of pinks and pale colors which actually is more summery. But, I love the bright, darker colors in the one Andrea is modeling here. And, I love the 2in1’s. They are solid and add a touch of color. I love the fringe and have it hang down one side, I have yet to try more than one color at a time. Note, that the 2 in 1 ones are crinkly which give nice texture or you can with a cool iron get rid of the crinkles. But, I love them and when I wash mine, I twist them to keep the crinkles in like I would wash an Indian crinkle skirt. It takes a while to dry this way, but is great to keep the crinkles in it. Now, I will need to check out how Andrea wrapped her signature tichel and see how it can still be comfortable on a hot day. That is one of my favorite color combinations. It reminds me of my lilacs and purple crocuses. So, the combination works since it is natural in nature. It will be great to wear in winter when tired of all the snow, if you live in an area with snow. It will give you and your co-worker a feeling of Spring which will make anyone happier. So, our tichels can brighten not only our days but for those around us. Another reason that I love the Wrapunzel colorful tichels. I do wish I lived in a snowy climate. I am in California and we don’t even get rain much anymore. Our winters have been so mild the last several years I haven’t even had a coat. Sweaters only. I am able to wear my pashminas still and it’s been over 100F. I do also keep them off my neck. I have very light skin, freckles and strawberry blonde hair so the sunscreen reminder is helpful. I tend to neglect myself and just run out the door. Where in California? My parents are in the San Francisco Bay Area, and my husband spent a lot of time in San Diego although he grew up in Maine. In winters, we live in Albuquerque, NM, where we do get some really strong and cold winds in winter with occasional 2-3 inches of snow since we are at 5000 ft in elevation. It is then, when I tied my pashmina in the back and let it keep my neck warm against the winds. I know how horrible the drought is in California. We have had drought now in New Mexico for a while. I pray the wildfires this summer are not too bad. At least, with the lack of rain, there is less undergrowth for fires. And speaking of flowers, my favorite are the California golden poppies. 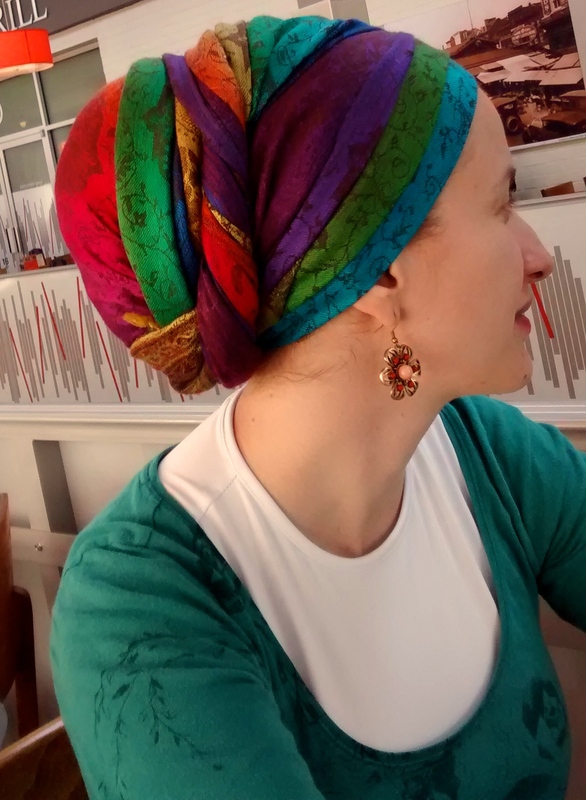 Now, that would make a lovely combination for a tichel: dark green with a golden 2 in 1? Hi Diane I just saw this. I am in Fresno CA. I spent the past weekend at the beach and got the top of my ears sunburnt. Let me tell you, that was *not* fun! This looks amazing, by the way. I have learned that it is best to do like a workout style with Israeli scarf and wear a broad brimmed hat over it. And don’t forge the sunscreen. My husband had a squamous cell carcinoma removed from his arm last year. It had reached the bone. Luckily, it was caught in time, but it told us we really need to be careful in the sun. And, Andrea make sure your baby is covered and use a sunscreen. They make them for babies’ gentle skin. We do not want any skin cancer ladies. Yes totally – baby was totally covered and fine… I was just kind of naive and figured half an hour in the sun would be fine unprotected… not so for my pale skin! I love that scarf! I wore mine for the first time on an Alaska cruise a few weeks ago. It was a big hit – and of course your wrap is lovely. Thank you – as always – for sharing. I love it when I see a Wrapunzel post in my inbox – it’s a bit of fresh air and joy for my day! It was a beautiful Tapestry day for me at university! With over 30°C in Germany too! But with this beautiful tichel on my head, I didn’t feel like I was melting, actually not at all! As you said, tichels help you to overcome the heat! Even in a heavy Tapestry one! I just felt the same strange “calling” this morning when I look up at the sunny weather and took the purple one… Silly? no! Just so cool! Hugs from over the ocean and schabbat schalom! Mirjam. Hi Julia – I sorry that you seem so offended! I am not sure what you mean… I would never give credit unless it was an original style, and Yael certainly came up with it on her own! 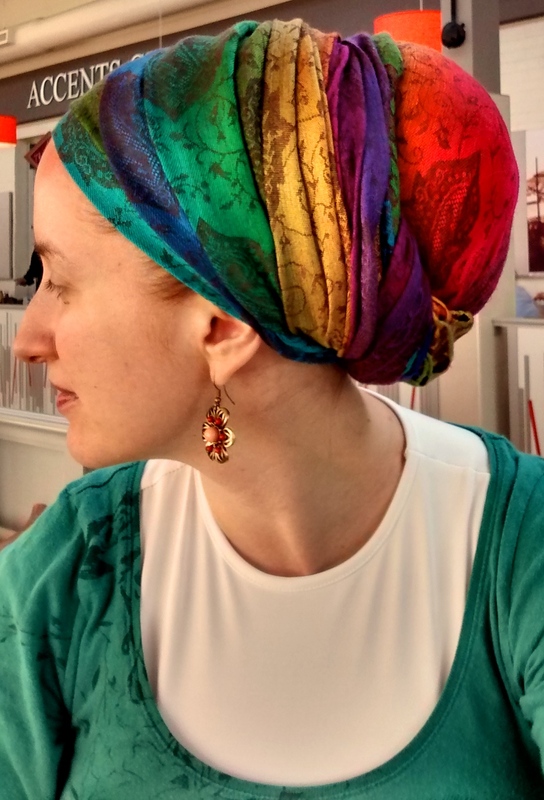 It is of course possible that someone has done it before (and that is the case for all the tichel tutorials I’ve ever made), and of course I would love to know who that was.